Beam — W10x17, min size. 1. Normal Weight or Lightweight Concrete — Normal weight, carbonate or siliceous aggregate, 148 + or - 3 pcf unit weight, 4000 psi compressive strength, vibrated. Lightweight concrete, expanded shale or slate aggregate by rotary-kiln method or expanded clay aggregate by rotary-kiln or sintered-grate method, 112 + or - 3 pcf unit weight 3000 psi compressive strength vibrated, 4 to 7 percent entrained air. 2. Welded Wire Fabric — 6x6 — W2.9xW2.9, 42 in. wide centered over beam. 3. Steel Floor and Form Units* — Composite. 1-1/2, 2, or 3 in. deep, 24, 30, or 36 in. wide, galv units. Min. gauges are 22 MSG for fluted, 20/20 MSG for cellular. Adjacent units button-punched or welded together 36 in. O.C. at side joints. 1. All fluted for 2 or 3 in. deep units only. 2. Blend of one or two fluted to one cellular. ASC STEEL DECK, DIV OF ASC PROFILES L L C — 32 in. wide Types NH-32, NHN-32,NHF-32; 36 in. wide Types BH-36, BHN-36, BHN-35-1/4, BHF-36, BHF-36A, 2WH-36, 2WHS-36, 2WHF-36, 2WHF-36A, 3WxH-36, 3WxHF-36, 3WxHF-36A, 3WH-36, 3WHF-36, 3WHF-36A, 3W-36, 3WF-36, DG3W-36, DG3WF-36. All units may be galvanized or Prime Shield. Non-cellular decks may be vented designated with a "V" suffix to the product name. CANAM STEEL CORP — 36 in. wide Type P-3623 and 24 in wide Type P-2432 composite. KAM INDUSTRIES LTD, DBA CORDECK — QL Types 24 in. wide, 3, UKX, 21, NKX, TKX, 2 in. 99; 36 in. wide, 2 or 3 in. 99. For use in blend only, 24 in. wide, AKX. CANAM STEEL CORP — 24, 30 or 36 in. wide, Types 1-1/2 in. BL, BLC; 24 or 36 in. wide, LF2, LF3, LF15, LFC1, LFC2, LFC3. Type BL, LF2, LF3 units may be phos/ptd. NEW MILLENNIUM BUILDING SYSTEMS L L C — 36 in. wide Type Mac-Lok 3. DESIGN ASSISTANCE CONSTRUCTION SYSTEMS INC — 24 in. wide Type DACS2.0CD, or DACS3.0CD. EPIC METALS CORP — Types EC150, EC156, ECP150. NEW MILLENNIUM BUILDING SYSTEMS L L C — 24, 30 or 36 in. wide Types 1.5CD, 1.5CDI, 1.5CDR, 1.5CFD; 24 or 36 in. wide, Types 2.0CD, 3.0CD, 2.0CFD, 3.0CFD, 3.0CFDES. Fluted units may be phos/painted or galvanized. VERCO DECKING INC - A NUCOR CO — FORMLOK™ deck types PLB, B, BR, PLN3, N3, PLN, N, PLW2, W2, PLW3, W3. Units may be galvanized or phos./ptd. Units may be cellular with the suffix "CD" added to the product name, respectively. All non-cellular deck may be vented or non-vented. VULCRAFT, DIV OF NUCOR CORP — 24, 30 or 36 in. wide, Types 1.5VLI, 1.5PLVLI, 1.5VLP, 1.5PLVLP; 24 or 36 in. wide, Types 2VLI, 2.0PLVLI, 3VLI, 3.0PLVLI, 2VLP, 2.0PLVLP, 3VLP, 3.0PLVLP. Types 1.5VLI, 1.5PLVLI, 2VLI, 2.0PLVLI, 3VLI, 3.0PLVLI units may be phos./ptd. 36 in. wide Types 1.5 SB, 1.5 SBR; 24 or 36 in wide Types 2.0 SB, 3.0 SB, 36 in. wide Type High Strength 1.5 SBI, 36 in. wide Type High Strength 1.5 SBN. Units may be phos/ptd. 4. Joint Cover — 2 in. wide, pressure-sensitive cloth tape. 5. Shear Connector — (Optional) Studs, 3/4 in. diam by 3 in. long, headed type or equivalent per AISC specifications. Welded to the top flange of beam through the deck. 6. Trench Header — (Bearing the UL Listing Mark). Constructed of steel with metal edge screeds. 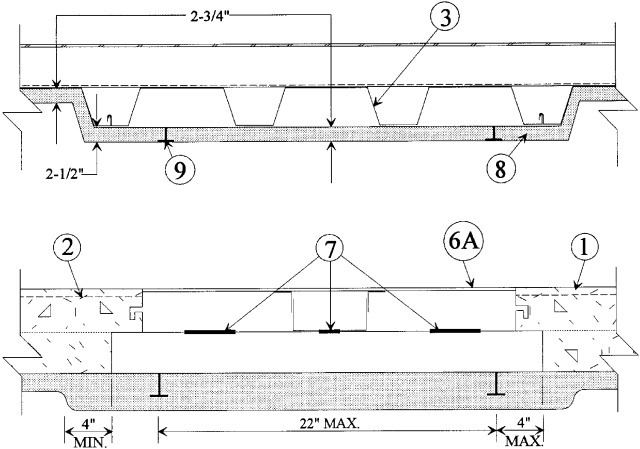 When the trench header is located near the supports the load carrying capacity of the span may be based on the allowable moment or shear stress of the form units at the edge of the trench away from the support, or on the allowable composite moment or shear capacity of the slab at the center of the span, whichever governs. The Spray-Applied Fire Resistive Materials thickness on floor units below this trench header shall be 1 in. below the bottom plane of units, with the flutes completely filled except for 2 in. and 3 in. deep floor units, where thickness in flutes shall be 1-1/8 in. 6A. Trench Header — Trench header (bearing the UL Listing Mark), without the bottom pan. The allowable superimposed load for spans with bottomless trench shall be based on noncomposite design. This trench header, with width ranging from min 12 in. to max 36 in., consists of two cell closers which conform to the contour of the floor units, placed along the sides of the desired trench location and welded to the floor units. The side rails, consisting of extruded aluminum screeds secured to galv steel channels (min 18 MSG) are positioned over the cell closers, aligned and welded to the closers and floor units. A separate U shaped channel (min 18 ga) serving as the power compartment, is welded to the floor units. Steel cover plates, 1/4 in. thick, shall be secured to the side rails. In bottomless trench headers wider than 18 in., each side joint of the steel floor units shall be welded with a 1 in. long weld near the trench header centerline. The use of this trench requires additional protection underneath the trench. Fireproofing thickness shall be increased to 2-1/4 in. in the crest, 2-1/8 in. on valleys and flat plates. These thicknesses shall extend a min of 4 in. beyond the edge of the trench header. 7. Access Openings — As required, with grommets. 8. Spray-Applied Fire Resistive Materials* — Spray applied by mixing with water in more than one coat, to a final thickness as shown below, to steel surfaces which must be clean and free of dirt, loose scale and oil. Min avg and min ind density of 15/14 pcf respectively for the Type Perlifoc LD, 15 and 15-High Yield, 22/18 pcf, respectively for the Type 22, 40/37 respectively for the Type 40 and 40T, 28/25 respectively for the Type 239, 44.5/42 respectively for the Type 240-High Yield or 241HY and 55/50 respectively for the Type 241 or Type 241 HD. For method of density determination, refer to Design Information Section. CARBOLINE CO — Types 15, 15-High Yield, 22, 40, 239, 240-High Yield, 241, 241 HD, 241HY. CARBOLINE (INDIA) PVT LTD — Types 15, 15-High Yield, 22, 40, 239, 240-High Yield, 241, 241 HD. PERLITA Y VERMICULITA SLU — Types 15, 22, Perlifoc LD, 40, 40T, 239, 241, 241 HD, 241HY. STONCOR SOUTH CONE S A — Types 15, 15-High Yield, 22, 40, 239, 240-High Yield, 241, 241 HD. 9. Steel Studs with Discs — The studs consist of a No. 12 SWG wire, 2-1/8 in. long attached to a 1-3/16 in. diam, No. 28 MSG (0.020 in. thick) galv steel disc. The total number of studs shall average at least one stud per 236 sq in. of cellular floor units beneath the trench header. The studs shall be welded to the cellular floor units in rows running parallel with the trench header. The distance between the rows and the edge of the trench header shall not exceed 4 in. The spacing between the rows shall not exceed 22 in. The spacing between studs along the rows shall not exceed 24 in. 10. Roof Covering* — (Not Shown) — Applied to concrete surface. Used only with Items 11 or 11 and 12. Class A, B or C Built Up Roof Covering Materials consisting only of felt and asphalt (or coal tar pitch) materials in alternate layers. See Building Materials Directory. 11. Foamed Plastic* — (Not Shown) — Optional — Rigid foamed plastic insulation boards. May be installed without adhesion after final asphalt glaze coat has cooled or bonded to the built-up covering. When applying more than one layer, successive layers shall be installed over preceding layer without attachment. OC CELFORTEC LP — Max. thickness 8 in. covered with crushed stone or concrete pavers at a rate of 10 psf min. DOW CHEMICAL CO — Max. thickness 8 in., extruded polystyrene foamed plastic boards. The unfaced boards shall be covered with crushed stone or concrete pavers, at a rate of 10 psf min. T CLEAR CORP — 4-3/8 in. thick, concrete mortar faced extruded polystyrene Lightguard Boards. 11A. Foamed Plastic (CCVW)* — (As an alternate to Item 11 - Not shown - Optional) - Expanded polystyrene insulation installed to a maximum nominal density of 2.0 lb/ft2. 12. Cellular Concrete — Roof Topping Mixture* — (Not Shown) — Optional — Foam concentrate mixed with water and Portland cement per manufacturer's application instruction. 28 day compressive strength of min 190 psi as determined in accordance with ASTM C495-86. Min 2 in. thick poured above the foamed plastic (Item 11 or 11A). May be covered with any built-up or single ply roof covering materials*. AERIX INDUSTRIES — Cast dry density of 37 (+ or -) 3.0 pcf. 13. Insulated Concrete — (Optional Not Shown)various types of insulated concrete prepared and applied in the thickness indicated. A. Vermiculite Concrete — Mix consists of 6 cu ft of Vermiculite Aggregate*, 94 lbs. of Portland cement and 6 oz of air entraining agent. Thickness to be 2 in. min from the top plane of steel roof deck. B. Perlite Concrete — Mix consist of 6.2 cu ft Perlite Aggregate* to 94 lbs. of Portland cement and 1-1/2 pt. air entraining agent. Compressive strength 80 psi min. See Perlite Aggregate (CFFX) category for name of Classified companies. 14. Metal Lath (not shown) — Where Types 40, 239, 240 High-Yield and 241/241 HD are applied to steel deck, 3/8 in. metal ribbed lath weighing 3.4 lb/yd2 shall be secured to the underside of the steel deck (ribs upward) with S-12 by 3/8 in. long panhead, self-tapping steel screws spaced 12 in. OC in all directions. Steel screws shall be fitted with 1/2 in. diameter steel washers. Adjacent pieces of lath shall be overlapped 1 in. min.